Click to open images on this page. 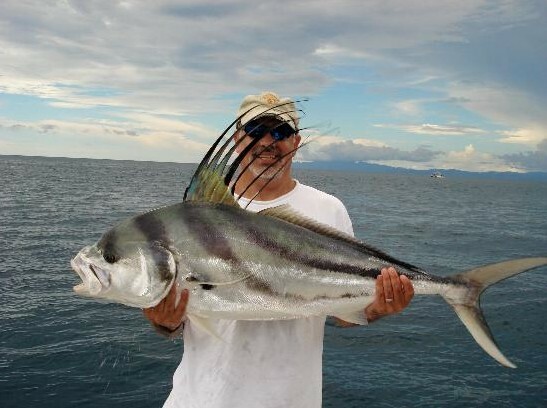 When you stay at Hotel El Velero in Playa Hermosa, Guanacaste, you will have plenty of options to keep you busy! Car Rental Services, a relaxing massage on our own beach, and lively nightlife (local bars, restaurants and disco) are available. Kayaks, canoes, snorkeling gear, bicycles and beach umbrellas can be rented at the hotel. Many tours are available in the area and we are happy to arrange them for you upon your arrival. Or contact us to arrange your tours prior to arriving. 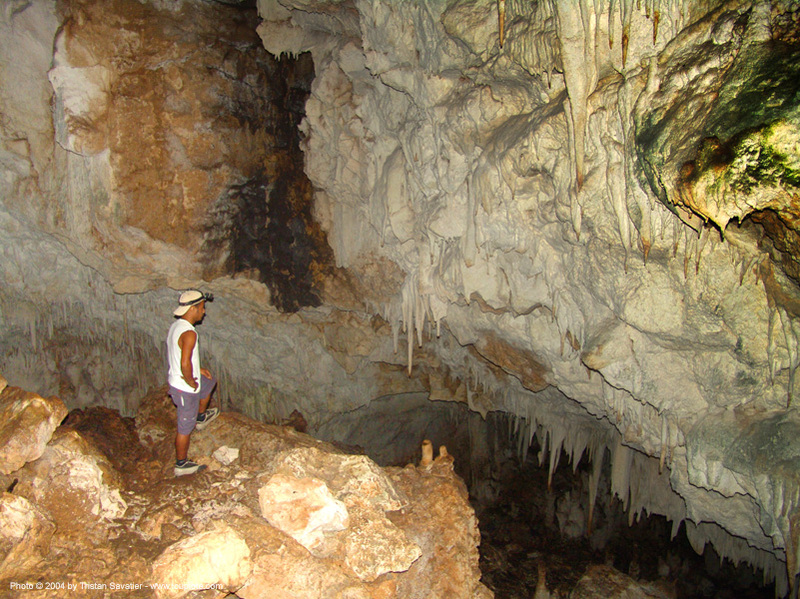 All tours are personalized and are offered for groups of 4 to 8 persons or more. Our knowledgeable, bilingual guides will look after all your needs while you travel in comfortable air-conditioned vehicles. Vista Ridge Golf Course – A Challenge unlike any other course you will ever play. Enjoy a round of golf surrounded by majestic volcanoes, howler monkeys laughing at your swing and a staff that makes you feel as if it was your ‘home’ club. To say that this course is a challenge would be a gross understatement, bring your ‘A’ game because nothing less than that will do. Vista Ridge is one of Guanacaste’s gems. It offers diverse scenery, challenging fairways and small greens. From the moment you step out of your car or taxi you feel as if you are on your ‘home’ course. Four Seasons Golf Resort Papagayo – This 18-hole, par-72 championship course was designed by Arnold Palmer. It spans over 220 pristine acres atop one of Peninsula Papagayo’s highest plateaus, overlooking the jeweled waters of Bahía de Culebra. Ranked among the “Top 100 Courses Outside the United States” by Golf Digest. The course, not only set amid crystalline waters but also deep green forests, has labelled important trees, turning the cart path into a botanical garden. Spectacular water views await you at 14 of the 18 holes. Four Seasons Costa Rica Golf Club at Peninsula Papagayo is a Certified Audubon Cooperative Sanctuary. Hacienda Pinilla Golf Course – The Golf Course at Hacienda Pinilla offers one of the finest settings for links enjoyment in a country renowned for its golf tradition. Created by respected architect Mike Young, the layout conforms gracefully to the natural flow of the land, weaving through the tropical forest along the shores of the Pacific to provide an unparalleled blue water backdrop. This par 72 course, which can play up to 7,200 yards, was designed to enhance the natural landscape of Hacienda Pinilla, giving golfers an exceptional and immaculately conditioned place to enjoy a round with family and friends. As a member of the National Audubon Society since 2001, we conserve water on the golf course and protect areas that are natural to Costa Rica’s wildlife sanctuary. 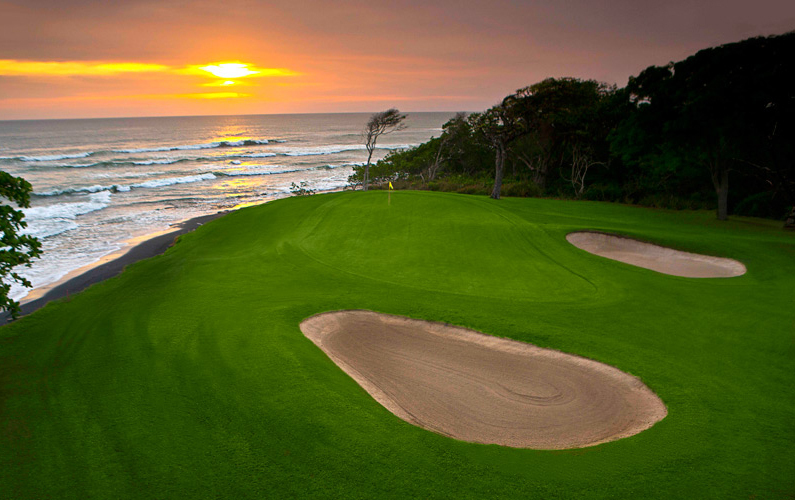 La Iguana Golf Course – The 18-hole championship La Iguana Golf Course in Costa Rica offers a par-72, Ted Robinson-designed layout and is situated alongside an exotic rain forest with breathtaking ocean views. The course at our Los Sueños resort also features a spectacular gallery featuring friendly monkeys and brightly hued macaws. Knowledgeable golf guides will be happy to point out all the beautiful Costa Rica highlights of our thrilling course. But make no mistake: The mesmerizing scenery masks a challenging game – one well worth conquering. Cariari Golf Course – (Members only.) 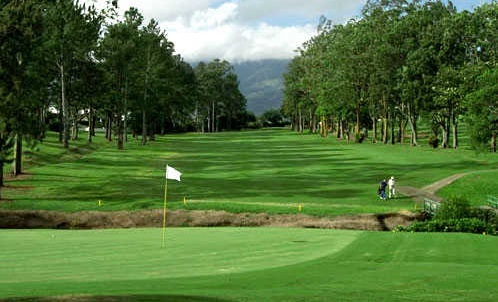 Designed by George Fazio and constructed by his nephew Tom Fazio, Cariari Country Club was the first 18-hold course to be built in Costa Rica. This championship course was founded in 1974. The land was once a coffee plantation. It is heavily wooded with narrow fairways and only a few fairway bunkers. The Bermuda grass greens are fairly large, fast and well-bunkered. One of the best in the country. This course is more difficult than average but a constant pleasure to play. Never Boring, Sometimes very challenging, always fun. Not walker friendly, it’s a long course. Somewhat narrow, some greens tough to hold, some beautiful vistas. Valle del Sol Golf Course – Golf course architect Tracy May designed Valle del Sol Golf Course to play through scenic nature in wonderful weather for 18 holes of championship golf. Valle del Sol owners acquired architect Tracy May to redesign the course, which was laid out in two stages. Water, in the form of small ponds or meandering streams, comes into play at almost every hold on the card. 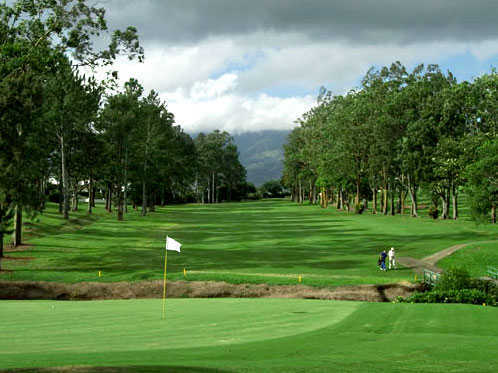 Golfers are strongly advised to avert their eyes from the distracting views of nearby Irazu, Barva and Poas volcanoes. Reserva Conchal Golf Course – The Reserva Conchal Golf Club offers a world-class experience designed in the classic tradition of the game by the legendary Robert Trent Jones II. On one side are breathtaking views of the Pacific Ocean. On the other, the lush forests of Costa Rica’s northern coastline stretch towards the azure sky. Each challenging nine meanders through the rolling coastal terrain, offering stunning ocean views. This 71-par championship course provides players of all skill levels with an extraordinary eco-golf experience. 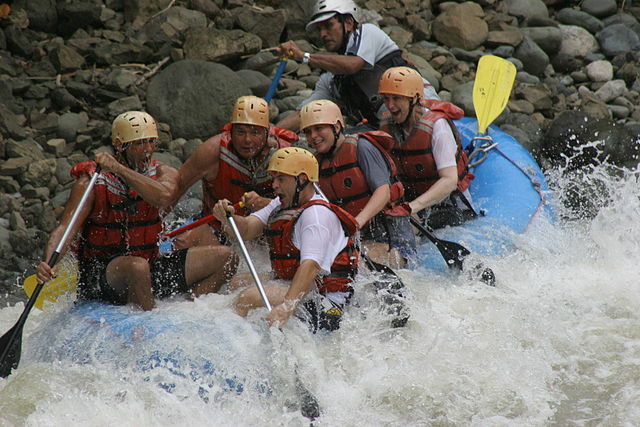 White Water Rafting – For rafters, this is a must-run river!Tenorio River White Water Rafting will test your courage and challenge your skills! You will receive safety instructions before you start the rafting trip. Plenty of excitement awaits you as you plunge through twists, turns and drops down 8 miles of intense, challenging rapids. You’ll experience over 20 thrilling rapids, and finish the tour by going over Costa Rica’s most extreme whitewater rapid – an intense 12-ft waterfall drop! You’ll witness the impressive canyon of the Tenorio River along with many different types of flora and fauna – there is a unique contrast of the red rocks against the green plants that line the canyon. Your guide will try to point out birds, monkeys and other types of wildlife as you make your way through highly technical and tight rapids along the way. The trip on the river lasts about two and a half hours. The drive, rafting, lunch and return trip home is about eight hours total. Learn More. Llano Cortes Waterfall Tour and Liberia Shopping Tour – The tour takes you to the pure, sparkling pool of water that has been kissed by the sun and purified on its journey over the wide ridge that creates a beautiful waterfall. The pool is still and relaxing and you can wade waste-deep to position yourself behind the curtain of water as it spills from above. Breathe in and relax and don’t forget your camera. Afterwards, visit Liberia and enjoy shopping and authentic tico cuisine. Nicknamed ‘the White City’ for its white gravel roads and whitewashed adobe buildings, Liberia retains a small-town atmosphere and plenty of colonial charm. Shop for unique handmade items like ceramics and wood carvings, plus regional specialties like Costa Rica’s famed coffee beans. 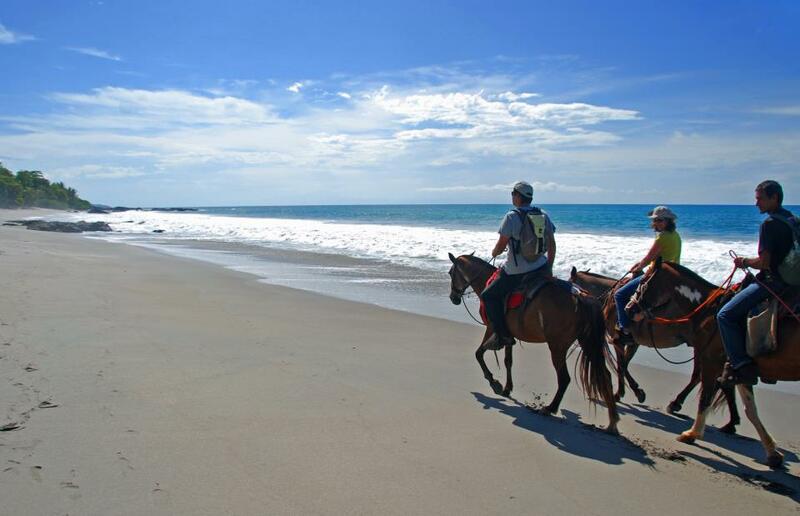 Beach Hopping ATV’s, Horseback Riding – (Horseback riding has limited availability.) Visit two of the most popular beaches of the Guanacaste northern coast, Conchal and Tamarindo. The perfect places to enjoy the sun, relax and go shopping. The ATV tour and horse back riding will start from Conchal beach and lead you to hidden beaches and mountain trails where you may see howler monkeys, exotic birds and visit tide pools. (ATV drivers must be 16 years old. ) What to bring: tennis shoes, shorts or long pants, t-shirt, towels, extra change of dry clothes, suntan lotion. Learn more. Surfing Lessons – Surf is nice to look at, but riding them is really a thrill you shouldn’t leave Costa Rica, without going through. 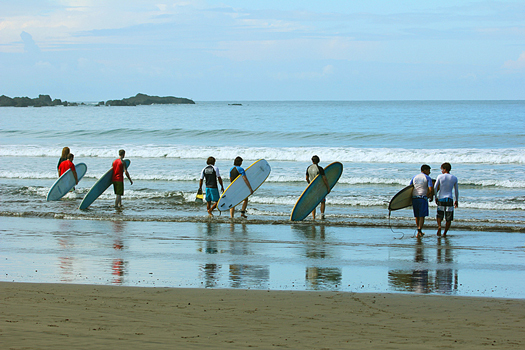 This is not merely a Costa Rica Surf Lesson: it’s step one in surfing. After experience teaching surfing we guarantee you’ll remain true and ride the very first waves in just one lesson! Surf Lesson begin on the beach, with a couple of theory and practicing the very best actions as well as the position take advantage close to the board. We may have you on a board and smiling very quickly, within the same waters where surf stories from across decades make pipeline history. Even youthful kids can learn how to ride the waves. Learn more. 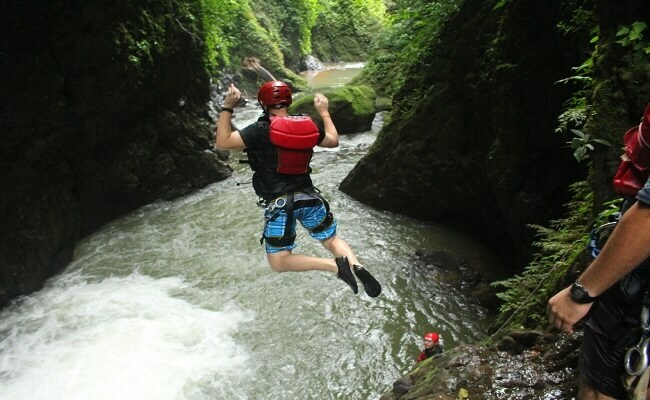 “Extreme Adventure” Mega Tour Combination – Create a Thrilling 9-hour Day Trip that will combine activities like an exciting zip-line canopy tour with 11 platforms and 10 cables, hike across hanging bridges, a very exciting 400-meter Waterslide – the longest mountain water slide, then horseback ride through the forest that will take you right to a spa where you can relax, apply a mud mask rich in minerals and swim in natural thermal pools while sitting beside the river. A stop at a waterfall rounds out your adventure. All in one day! We call it Adventure PLUS! What to bring: bathing suit, cameras, bug spray, hiking shoes or similar, long pants or shorts, t-shirt. Tour includes: a/c transportation, bilingual guide, canopy tour, water slide, horseback riding, lunch, and spa entrance. Learn more. Miravalles Water Falls and Hot Springs Adventure – The Waterfall Canopy Tour will provide the most incredible sights of the Tropical Humid Forest. At the beginning of this hike you will cross a suspension bridge and experience a beautiful water fall, as we walk our guide will describe all the secrets of this forest and keep searching for animals and trees with epiphytes, flowers, ferns and another outstanding waterfall. Then walk inside the crater of this active volcano where you can see the steamy sulphur water ponds, bubbling mud, fumaroles and try the therapeutic properties of the mud and natural hot springs. If you still have energy, continue with a Canopy tour, a souring network of cables, pulleys and hanging bridges that allows you to explore a fascinated ecosystem from another perspective. This canopy is located in a private reserve and would give you the feeling of been in a cloud forest. What to bring: Long pants, t- shirt, extra change of dry clothes, rain gear, hiking shoes, bathing suit, towels, insect repellent, binoculars, camera. Learn more. 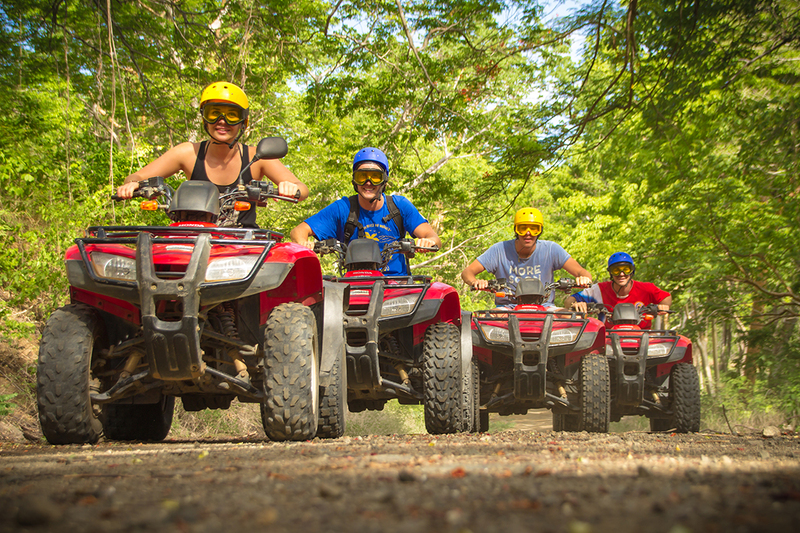 Quad – ATV Tours – Jet Skis (limited availability) – Another way of exploring a forest in Guanacaste is by taking a tour on a quad cycle or a 4-wheel ATV.A two-hour guided tour depart from Playa Panama passes through the village of Panama. Then your guide will lead you across hills, rivers, forests and sugar cane fields, often accompanied by Howler monkeys, birds or butterflies. Feel like an adventurer and enjoy the thrill of driving a quad! Guided Tours can have – 1 adult per vehicle, 1 adult and 1 child per vehicle, or 2 adults per vehicle. OR … choose a “One-Hour Jet Ski Bay Tour” or a “Two-Hour Ocean Jet Ski Tour! (Jet Ski or ATV drivers must be 18-years-old or accompanied by an adult.) Learn More. 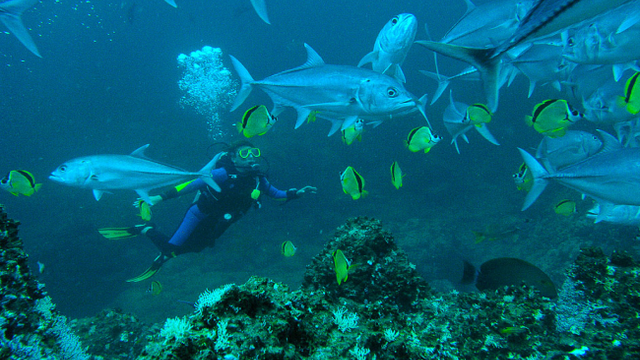 Scuba Diving Packages – Costa Rica’s warm, clear waters make for enjoyable scuba diving, snorkeling and water sports. The region around our hotel boasts some of the best diving in the country. Several operators are available to choose from. Make your reservations in advance for scuba and snorkeling tours. Divers are picked up on the beach side of the hotel. Contact us for more information and reservations. You will be picked up for fishing from the Hotel El Velero entrance to the beach at 7:00am. Local Fishing – Take a bay fishing tour with a local guide on a 24-foot “panga” boat. 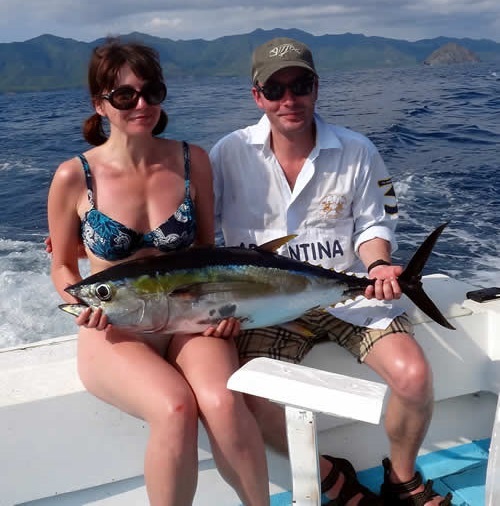 Catch seasonal fish such as Mackerel, smaller Dorado and Tuna. $225 US (no lunch, no beverages). Sea and fresh water fly fishing also available. Bird and Nature Watching – There are many reasons Costa Rica is preferred by birders: it’s a small country with varied habitats and an astounding biodiversity. The variety and quantity of Costa Rican birds you can observe in this country is amazing. With 874 species divided into 64 families, there is plenty to look for. Many birds are easy to see throughout the year, including the Emerald Toucanet, Black Guan, Collared Redstart, Blue-crowned Motmot, Kinkajou, and half a dozen or more species of dazzling hummingbirds. Resplendent Scarlet Macaws have recently been spotted near the banks of the Tempisque River. When birding, Costa Rica’s many wonderful wonders will take your breath away. Due to the dense foliage, the only warnings you’ll have of the incredible birds in the vicinity are their songs and calls. The Kiskadee sings throughout Costa Rica, the Long Tailed Manakin with its red crest and bright blue back you’ll see in abundance in the humid forests and Santa Rosa, calling out “Toledo”. Another striking bird is the Blue Crowned Motmot: bright turquoise with a long tail feather with a knob at the end. It’s an interesting specimen with peculiar behavior: its namesake song sounds like a dog playfully barking and when it perches it “wags” its tail. Canopy Tours – This tour is a favorite among many of our guests no matter their age. Safely harnessed, you will repel from one treetop platform to another…. As free as the wind! Get a new perspective on the world as you see it atop ancient trees. A true adrenaline rush! Pickup is available from Hotel El Velero on the beach in Playa Hermosa, Guanacaste and in 25 minutes you can be harnessed and sailing over the tree tops. Safely harnessed, you will soar through the air from one treetop platform to another, free as the wind…. Adrenaline rushing through your body…. Exhilaration like no other as you fly like a bird! You get a new perspective on the world as you see it from the top of ancient trees. From this advantageous position, you’ll enter the habitat of numerous species. Definitely a must for the adventurous souls. You will want to bring your camera to capture the momen. 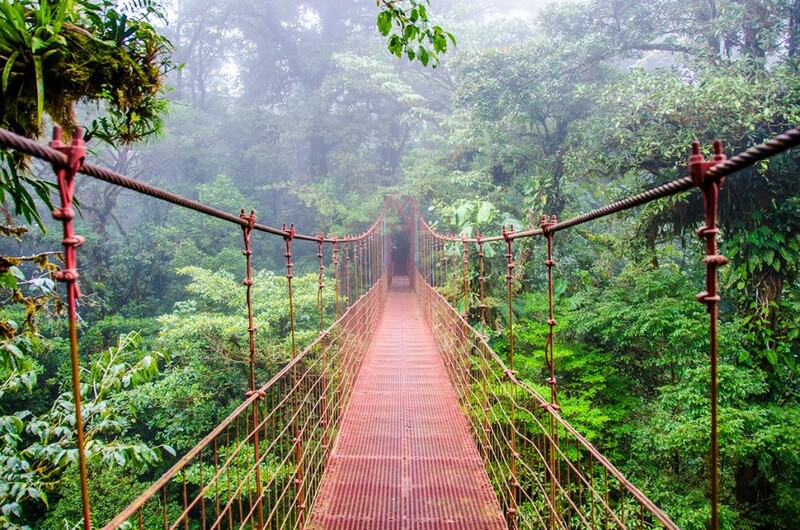 Monteverde Cloud Forest – Requires an overnight stay. This world famous reserve will provide beautiful scenery for a great hike through the wonders of the cloud forest. Your guide will search for the most incredible birds and you can admire the prehistoric ferns and the trees full of epiphytes and moss. 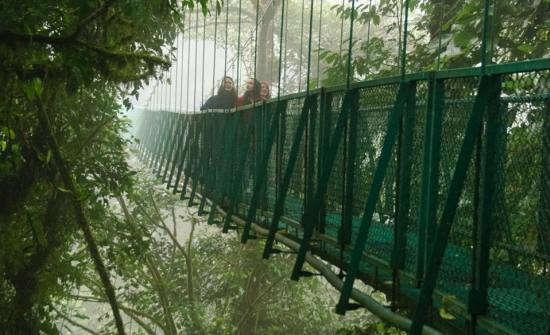 The treetop walkways are approximately 3 kilometers and cross the cloud forest on 8 different suspension bridges. In addition you will explore a community that gathers more than 20 species of tropical butterflies, a beautiful garden with more than 14 species of hummingbirds and the third largest private insect collection of the world. 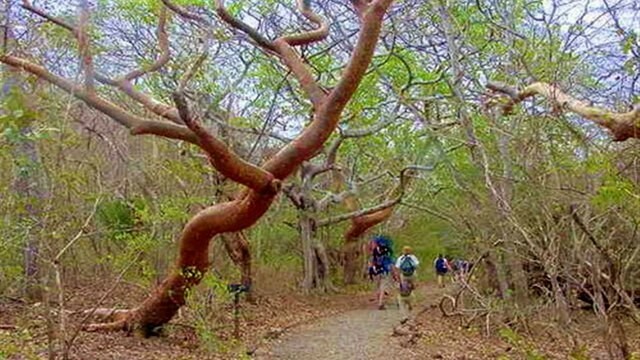 These popular attractions are near Hotel El Velero in Playa Hermosa, Guanacaste. Guided tours are available but you can also take these day trips yourself if you have rental car. 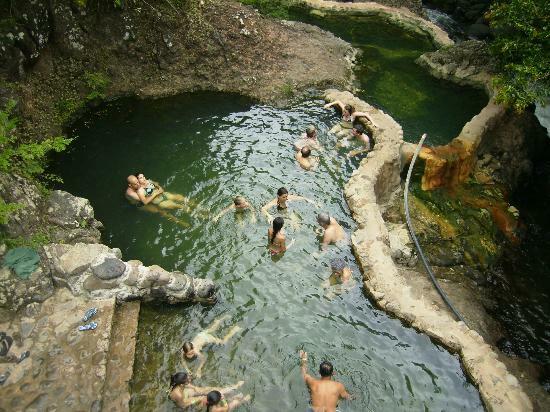 Rincon de la Vieja National Park – An hour drive from our hotel on rough roads is a unique park with volcanic activity including numerous fumaroles, hot springs and mud pots. 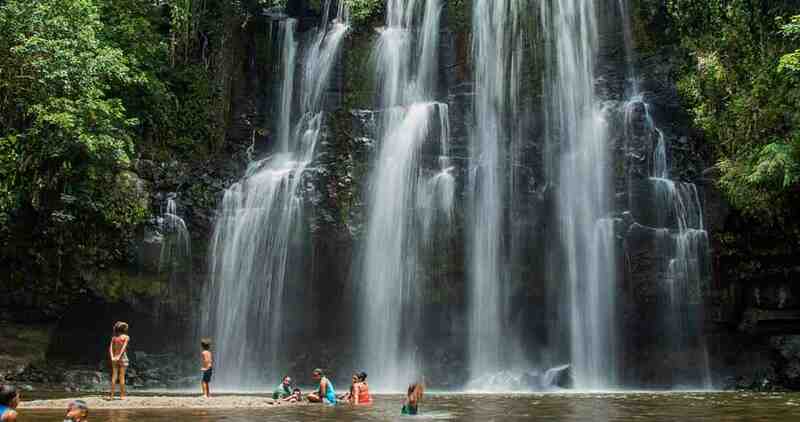 Hiking trails to waterfalls and craters. Horseback riding tours and camping are available. The park has a variety of wildlife, such as over 300 species of birds, such as the three-wattled bellbird (Procnias tricarunculata) and emerald toucanet (Aulacorhynchus prasinus), and also various quetzals, curassows, eagles, etc. The park has a variety of wildlife, such as over 300 species of birds, such as the three-wattled bellbird (Procnias tricarunculata) and emerald toucanet (Aulacorhynchus prasinus), and also various quetzals, curassows, eagles, etc. Mammals seen in the park include cougars, monkeys, kinkajous, jaguars and many more. The volcanic vents and geysers are habitat for certain extremophile micro-organisms. 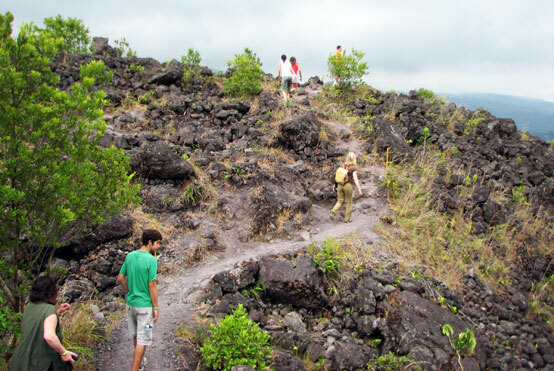 Hiking Rincon de la Vieja – Located in the Northern Volcanic Mountain Range of Guanacaste, you can find Hot Mud Pools, Hot Water Springs and the “Fumaroles”. 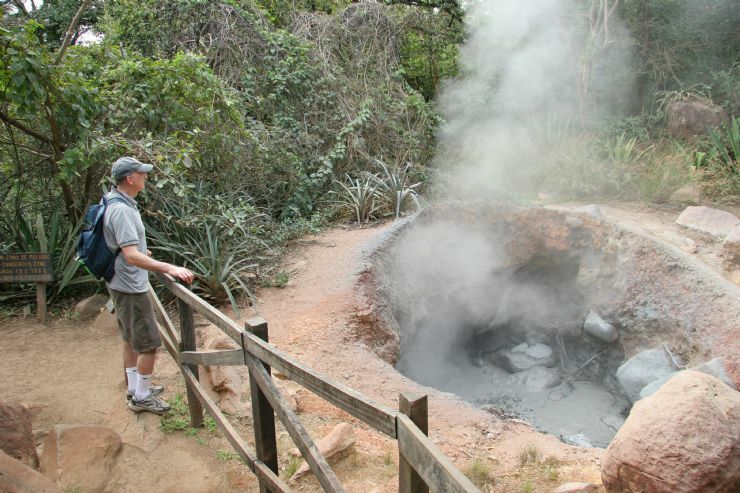 Canopy Tours, Horseback Riding, Bird watching, Hiking and swimming, soaking in volcanic mud pots are some of the popular activities at Rincon de la Vieja.Although the Rincon de la Vieja peak is active, it is unlikely for it to have a major explosion since it is constantly venting off steam and heat through the fumaroles that dot the terrain. The hornillas are a collection of mud cones, mud pots and vents you can visit, their most active period is the rainy season. This region is still a Cattle Ranching area, and you can still find huge Haciendas with old Ranches. This creates a unique and almost bizarre landscape, finding vast ranches and forests with nothing in it but wilderness. Santa Rosa National Park – About 1 hour from our hotel, you can see the country’s largest area of tropical dry forest, with caves for exploring, pristine beaches and basic camping facilities. It was the first national park established in Costa Rica, created in 1971. The Interamerican Highway (Pan-American Highway) is along its eastern edge, where the adjacent Guanacaste National Park is located. The beach at Naranjo is also famous for surfing, and the area near witch’s rock was a filming location for the cult surfing classic ‘Endless Summer II.’ There is also a history museum in the park. From outside the park you can arrange scuba-diving trips to Islas Murciélago, (the Bat Islands), off the Santa Elena Peninsula. Palo Verde National Park – A bird watcher’s paradise and one of Costa Rica’s best kept secrets. Palo Verde National Park is part of the Tempisque Conservation Area, that contains much of the area of the valley of the Tempisque River. Parajos Island, which is located in the middle of the Tempisque River, is usually a great place to spot birds. 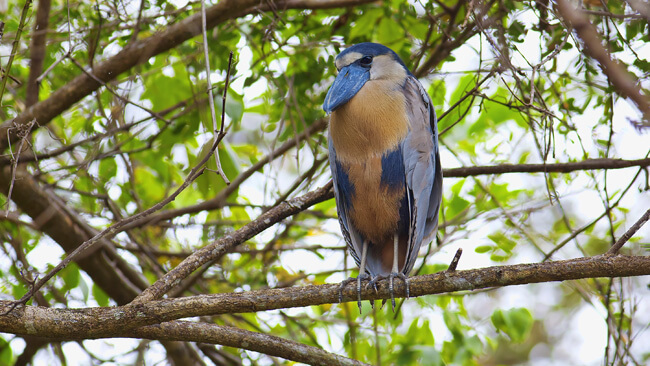 This island is the largest nesting site for the black-crowned night-herons in Costa Rica. A major feature of the park is the density and variety of bird species, a major factor in the creation of the reserve, due in part to its diverse ecology, with 15 different topographical zones from evergreen forests to mangrove swamps. Birds spotted regularly in the park include great curassows, scarlet macaws, white ibis, roseate spoonbills, anhingas, jabirus, and wood storks among many others. The area supports more than 50,000 water fowl and forest bird species. Camping facilities are available. Barra Honda National Park – Approximately 2 hours from our hotel. This underground National Park is a series of limestone caves that were once a part of a coral reef and is now a spelunker’s delight. Barra Honda National Park is part of the Tempisque Conservation Area about 12 km (7.46 mi) from the Tempisque River. It was created in 1974 to protect its famous cave systems, under the Barra Honda Peak which was formed when islets from the Miocene Era were raised above the plains of the river. The caves and waterways there today were then carved out by the action of rain filtering through the limestone over 70 million years or more. Due to its unique underground features, the park is also home to several rare species. These include blind salamanders and endemic fish that have adapted to living in complete darkness. Arenal Volcano National Park – Arenal Volcano National Park is a Costa Rican national park in the central part of the country, forming the Arenal Tilaran Conservation Area. Hotel El Velero is approximately 2 hours and 45 minutes from Arenal via rental car. There are also day trips available which include lunch, an English speaking guide, entrance to the hot springs and transportation. Do not miss this natural wonder while you are in Costa Rica! Grayline Tours Costa Rica bus service operates tours from Hotel El Velero to Arenal. One of Costa Rica’s most spectacular sights is the active Arenal Volcano. At its base are several hot springs that allow one to see (on a clear night) and hear eruptions. Intermittent rumbling explosions and nocturnal fire spitting are mesmerizing. Lava cascades down the side of this nearly perfect conical volcano. See photos at ArenalNet. 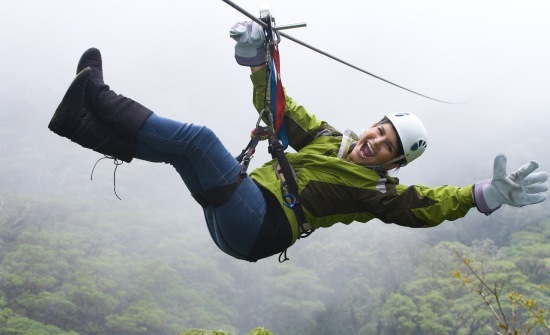 Hot Springs, Arial Tram Sky Trek, Hanging Bridges – Soar, glide, and trek through the rain forests of Arenal on this triple combo tour at Sky Adventures park. Take in stellar views of waterfalls and the famous Arenal Volcano from hanging bridges on the Sky Walk, ride up to a mountain top on the Sky Tram gondola, and fly through the treetops and across canyons on the Sky Trek zipline course. 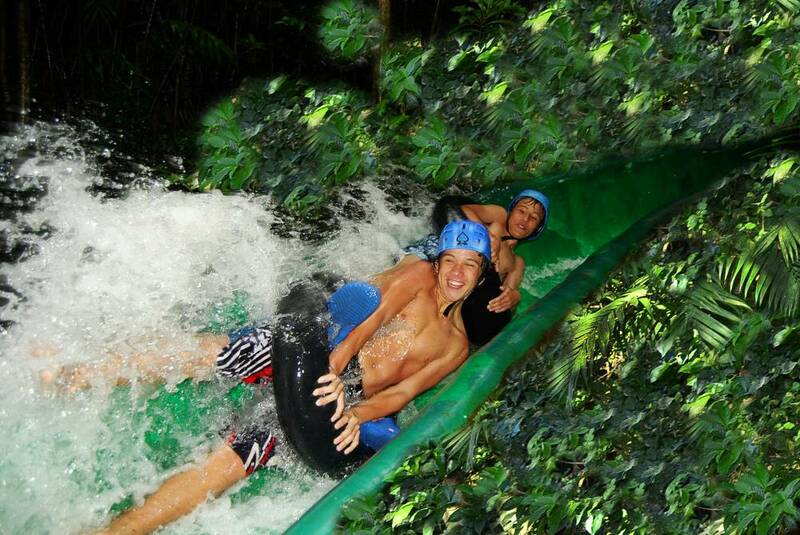 It’s an unforgettable way to experience the dramatic landscapes of La Fortuna. This is a day trip. Learn more. Available November 15th to February 15th only are the nesting grounds for a variety of sea turtles. Lucky nature watchers can see these lovely beasts coming ashore at night to lay their eggs on secluded beaches. Two such regions are a short drive from our hotel. Playa Grande in Las Baulas National Park – Approximately 1 hour south of Hotel El Velero is a principal nesting site for the Giant Leatherback Turtle, the largest turtle in the world! You will have a unique opportunity to see these beautiful creatures. 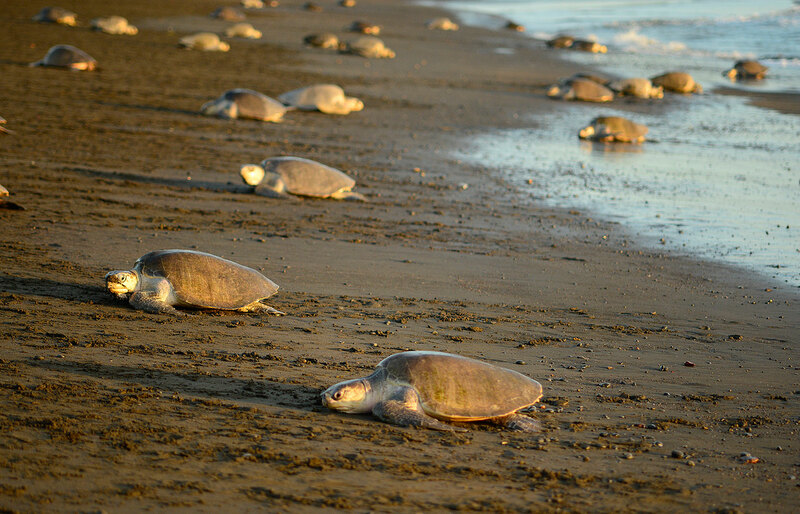 Night tours are offered during turtle nesting season (November 15th – February 15th) with pickup and delivery to our hotel. 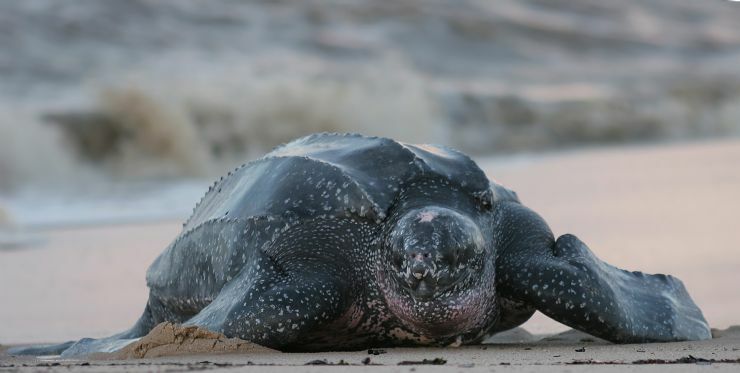 Visit The Leatherback Trust for beautiful photos and information about the leatherback turtles located at Playa Grande. With special supervision devoted to the the soft sand, upper portion of the beach, walking on this area is prohibited as it could damage a nest of incubating baby sea turtles. 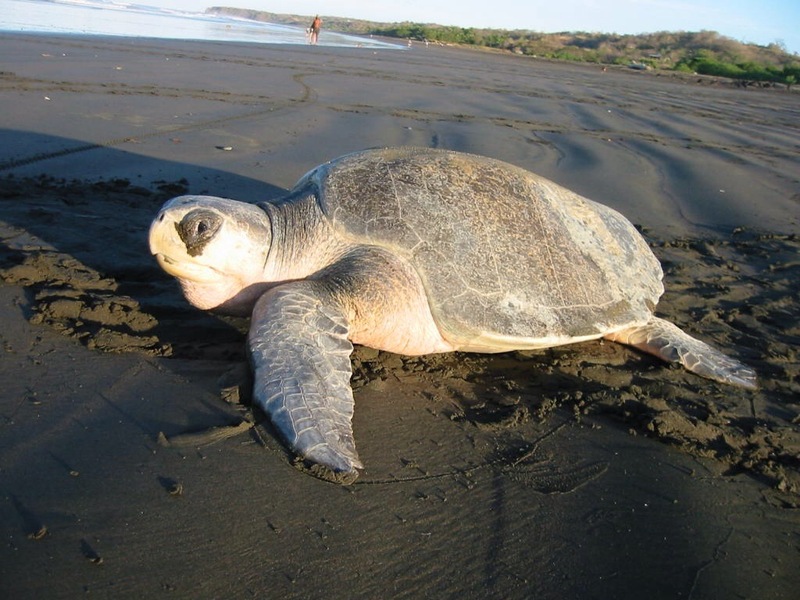 Playa Ostional National Wildlife Refuge – About 1.5 hours from our hotel, you can see mass nesting of the Olive Ridley sea turtles 4 to 10 times between July and November. You must have a reservation with the National Park Service to visit. Visit Ostional Wildlife Refuge for more information regarding Ostional National Wildlife Refuge on the Nicoya Peninsula. Learn more about Ostional Wildlife Refuge.